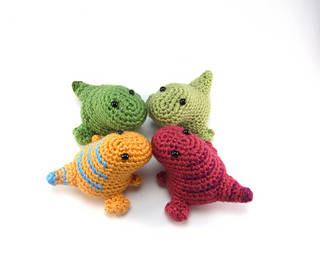 Wee Rex is a cute baby sitting t-rex whose pattern is available for free! 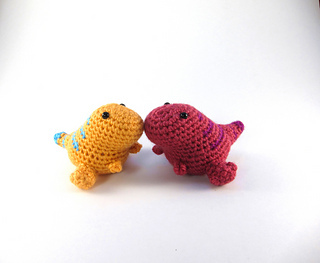 Since he can be made in just a few hours with leftover yarn, he’s a perfect quick project to make for yourself or as a gift for any dinosaur lover you might know. Make a whole bunch! Pattern is 8 pages long and includes photos and all the instructions you need to make your own Wee Rex. Finished size: 2.5” tall, though your finished size may vary depending on your yarn weight, hook size and tension. Double up on your yarn or use a thicker kind to make a larger Wee Rex! I am happy to offer email support if you need any help while working through my patterns! This pattern is for personal use only.